Human kind has always had interesting ways of dealing with death, and in particular, dead bodies. From sending our beloved off to sea in a burning boat, to entombing them forever in towering pyramids, it seems we’ve tried it all when it comes to commemorating lives and remembering our past friends and family. These days, burial seems to be the preferred method of providing a home for our lifeless bodies. However, in a world where access to land is ever shrinking, the process can be expensive and, in some senses, wasteful. Cremation is becoming an increasingly popular alternative for a number of reasons, from cost and practicality, to the desire to be able to to have one’s remains for memory’s sake. 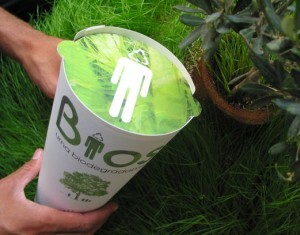 Now, a product called Bios Urn, allows for you, after cremation, to be buried in a bio degradable urn that contains the seed of a tree which will one day grow into a towering tree, using your ashes for nutrients in years to come. Bios Urns essentially complete the cycle of life, from death to life, by giving a tree the opportunity to grow strong and tall from your remains. You can even select the species of tree you wish to give life to. Imagine a cemetery evolving from a forest of stones, crosses and angels, to a forest of living breathing trees supporting the natural environment, growing from the remains of once living creatures. It’s an odd concept, but quite beautiful none the less.